We have just passed a small group of cyclists in their late 50's or early 60's. They are riding bicycles which can only be described as archaic. One of the bikes is an antique - something you might find at the back of the shed where it is has been quietly rusting away for the past half century or so. The group has only two bottles of water between six people The guy riding the antique is wearing long pants, not the lycra ones you see cyclists wear in cold weather, but a pair of chinos more suited to a night out at the pub than a long cycle in Australia. A couple of the other riders are also dressed in street wear - long pants, shirts and jumpers. They are laughing and joking as they navigate, slowly and unsteadily, the long decline from Eglington Cutting toward Cathkin. The antique guy wearing the chinos claims to have no brakes. David somewhere along the long steady decline from the Eglington Cutting toward Cathkin. It might look flat in this photo but trust me it isn't. They stop and ask us how far it is to Yarck. They began their cycle at Alexandra with the intention of doing a return ride to Yarck. It is already mid-afternoon and although there must be five hours of daylight left I wonder whether they can make it. It is only about 12 kms to Yarck (I mistakenly think it is a lot further) but this means they have almost 30 kms to cycle altogether - and they have made a rookie mistake. They have started from the wrong end of the trail, setting themselves the task of doing the hardest part of the cycle, the climb from Cathkin back up to Eglington Cutting, at the end of their ride. (Refer here to Rule 5 of my Six Essential Rules of Holiday Cycling). By the time they reach the beginning of the climb they will be tired and worn out. I express my concerns as diplomatically as I can but they laugh them off. The 'antique' guy says he'll make Yarck and back or die trying. If we pass someone later sprawled out beside the trail, utterly exhausted, he says it will be him. We wave goodbye, with David and I in admiration of their sense of adventure, if not their good sense. I wonder whether they will make it! If you have ever wondered why I don't post a lot of photos of myself, the answer is because most of the time I look exhausted. This photo was taken at the beginning of the ride so I don't look worn out for once. 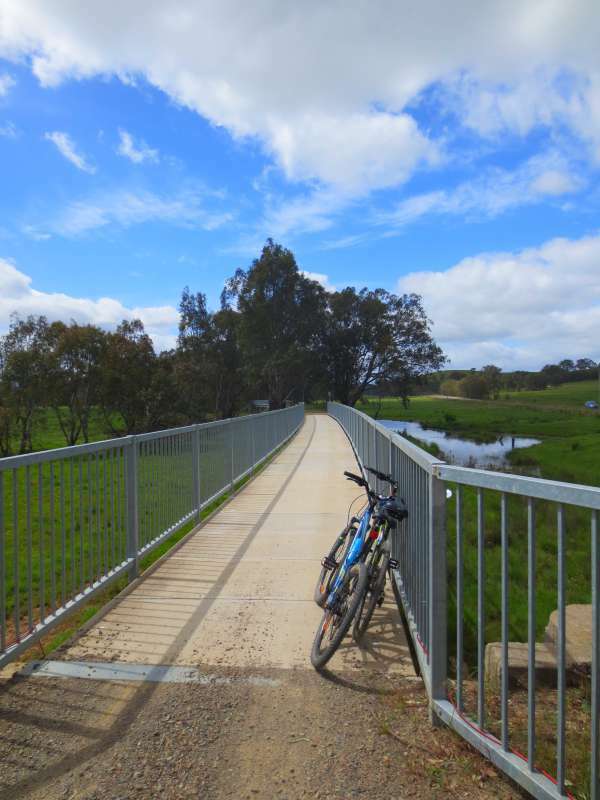 The Great Victorian Rail Trail is Australia's longest Rail Trail, running from Tallarook (96 kms north of Melbourne) to Mansfield, with a side trail to Alexandra about half way along. The whole trail is 134 km. Altogether we spend three days cycling the trail, broken up into manageable sections. As usual we miss out almost as much as we actually cycle. Refer here to my post on The Otago Rail Trail and A Universal Truth. We have plans to return later this year or next so keep an eye out for Part 2 of this post. This is the prettiest section of the trail. 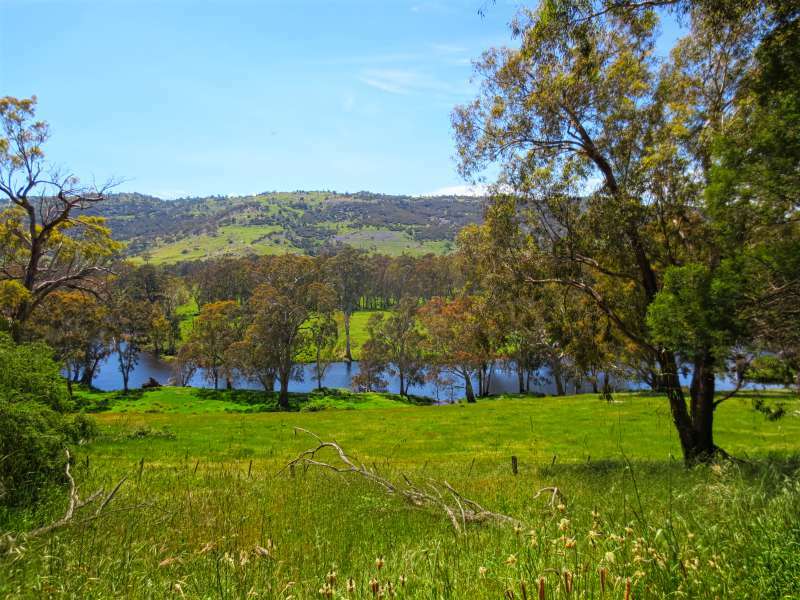 For much of the time the path runs next to the Goulburn River through countryside classified by the National Trust for its scenery. This section of the rail trail is almost completely flat. We start at the Kerrisdale end but it makes no difference to the ride which end you begin at. Looking across at the Goulburn River. Parts of Australia are so green from the unusally heavy rainfall in the last year I barely recognize them. There are very few facilities along this part of the trail. 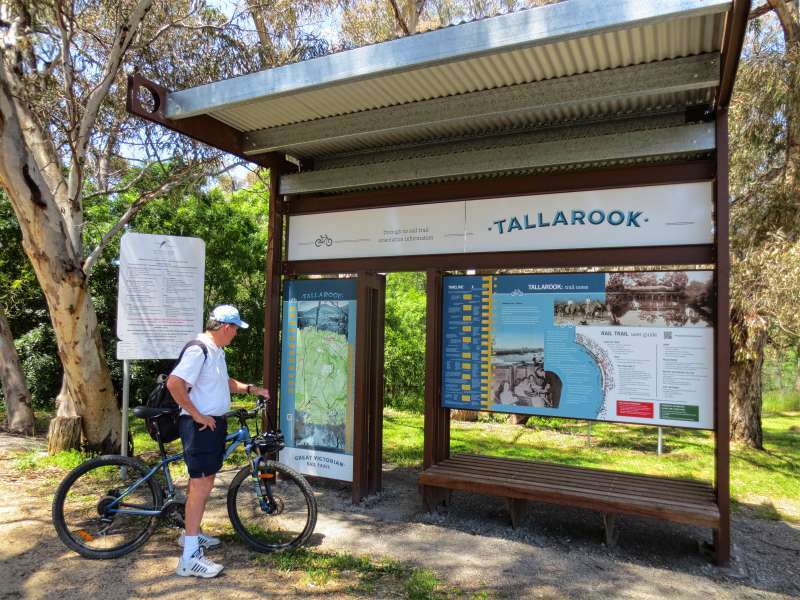 Tallarook is something of a cafe desert, although we cycle past one small cafe near the railway station. If you are desperate you might get a pie or something in the town itself. Although The Trawool Valley Resort 16 kms from Tallarook has a website which says it serves lunch, I suggest you read the TripAdvisor reviews before planning to either stay or eat there. David, studying the map at Tallarook - I'm pretty sure he is adding up the distances back to where we parked the car. This is the part of the trail where we meet the group riding the antique bikes. 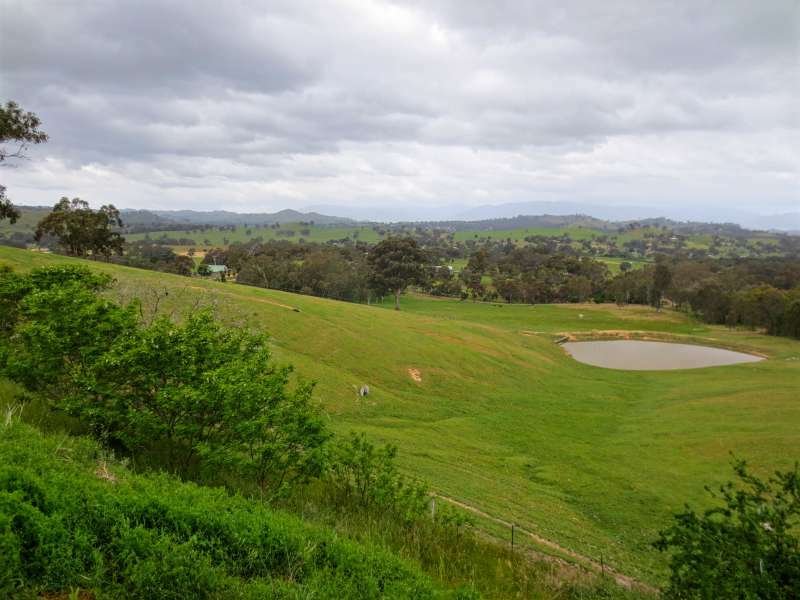 It might be shorter than the section from Tallarook to Kerrisdale but it is more demanding. The first few kilometres out of Cathkin are flat and easy, after which the trail begins to climb. This is one of those never-ending climbs - about 8 kms in all. It isn't difficult but it is unrelenting. Every bend brings with it the promise of the top of the hill and every bend save the last one, disappoints. At the high point is a wooden picnic table where we catch our breath and admire the views before the welcome downhill run into Alexandra. Although the return cycle from Alexandra begins with an uphill section of a few kilometres, once we conquer the climb it is freewheeling all the way to Cathkin. There is definitely a right direction and a wrong direction in which to tackle this ride, especially if you start out late, aren't well prepared and intend to cycle to Yarck or beyond. If you are hiring bikes then you will probably have to begin at Alexandra - Cathkin is a name on a map and not much else. Just make sure you leave yourself plenty of time and energy to tackle that long uphill on the way home. Alexandra has lots of cafes, making it a great turn around point. We have a picnic lunch with us so I can't give you a recommendation but one or two of them look lovely. I confess I have a soft spot for tunnels and bridges. They are always interesting. I once lost David in a long, dark rail trail tunnel in New Zealand - click here for the story of how it happened. The Cheviot Tunnel is 201 metres (660 feet) long. 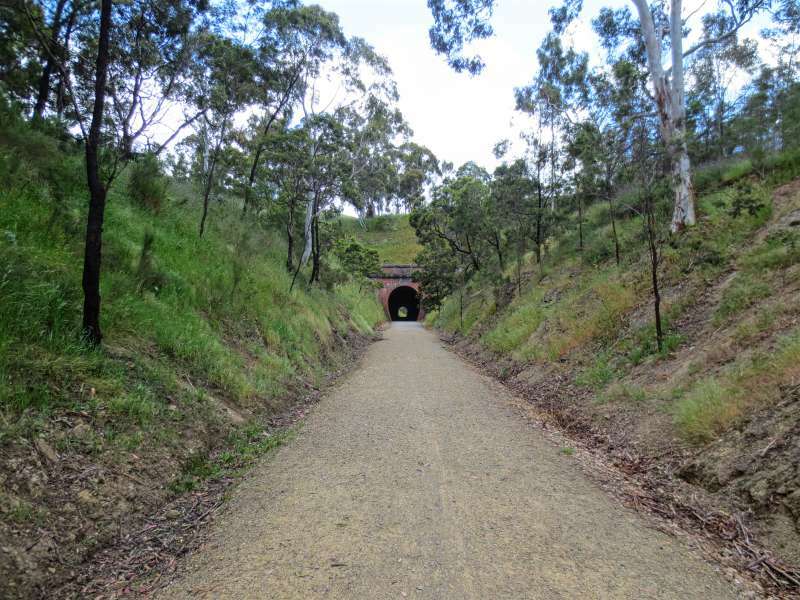 Built in 1889 it was the longest rail tunnel in Victoria. 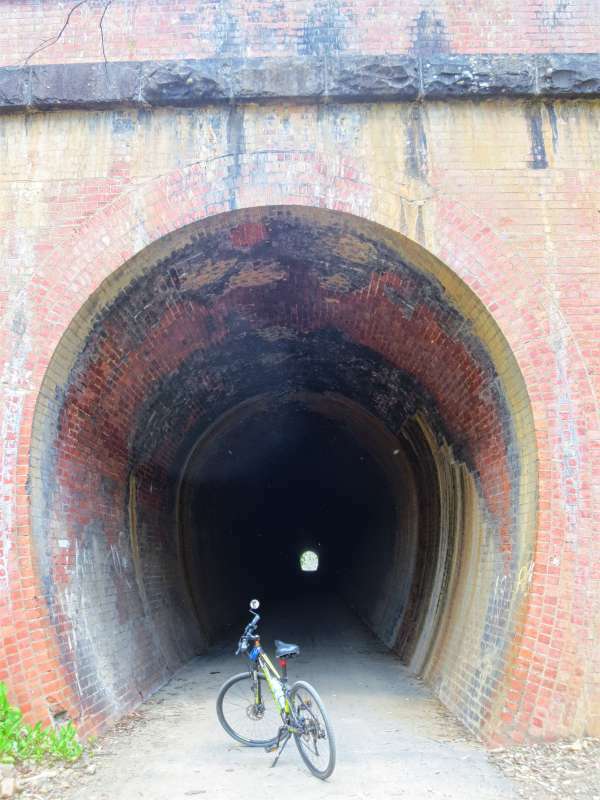 I don't want to leave the Great Victorian Rail Trail without cycling through the tunnel so on our last morning we park the car at Yea and cycle to the tunnel and back. 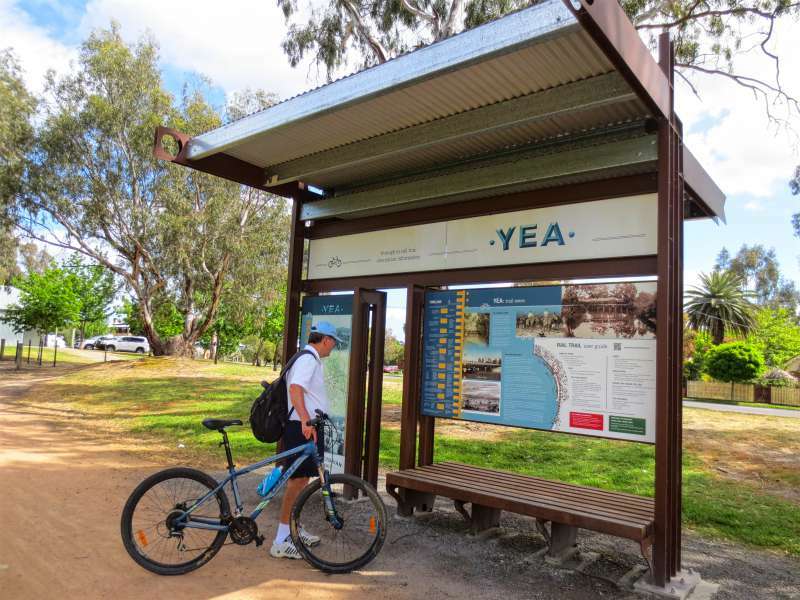 Yea is one of the larger towns in the area with plenty of accommodation and other services. The trail goes straight through town, making it a useful overnight stop for anyone cycling the whole trail. Bridges are fun too. This one is just outside Yea. David adding up distances on the map again - this time in Yea. I know what you mean about biking the same routes. David has a favourite ride in Sydney which is driving me mad. It is a great cycle but after the 100th time I am getting just a little over it. It is easy and the scenery is lovely. Love the tunnels! Hope that other group was okay. I'm sure they made it. It wasn't particularly isolated countryside so even if they ended up walking they would not have been in any danger. Looks like a lovely route David picked for you. 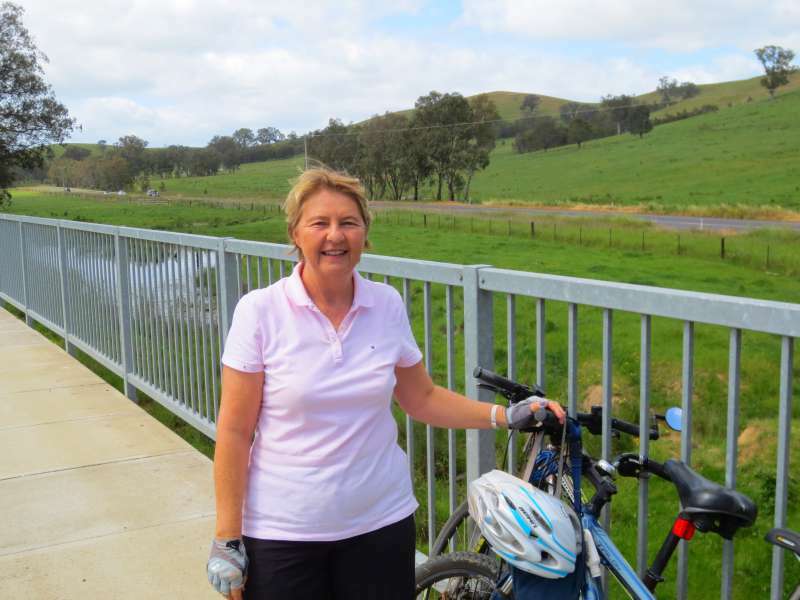 Looks very scenic Lyn, loved the shot taken in Goulburn. Surprisingly the Goulburn River is nowhere near Goulburn. The river is in Victoria, which is where I took the photo. The town is in New South Wales. It is the one with the Big Merino, on the Sydney to Canberra road. Your posts make me homesick! So lovely. You seem to be having a pretty good time travelling so you can't be too homesick - lol! What a great bike ride. I have a feeling that I could have been that guy on the trail, although I would have been a little better prepared, maybe. 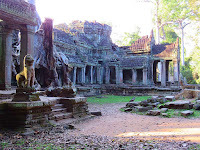 Thanks for linking up with #wkendtravelinspiration! That guy and his friends were just having a ball. I don't think they really cared whether they got to their destination or not. The trail looks amazing! Especially the section between Tallarook and Kerrisdale with the blue river! Never heard of The Great Victorian Rail Trail here in Europe, although really should: always learn new awesome things from your blog! Thanks for sharing! 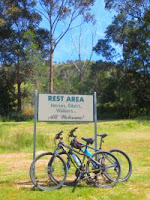 Australia, especially Victoria, has quite a few very enjoyable leisure trails. You can cycle for days on end or do what we do and break them up into shorter rides. I always find that old railways make great trails, either for cycling or walking. 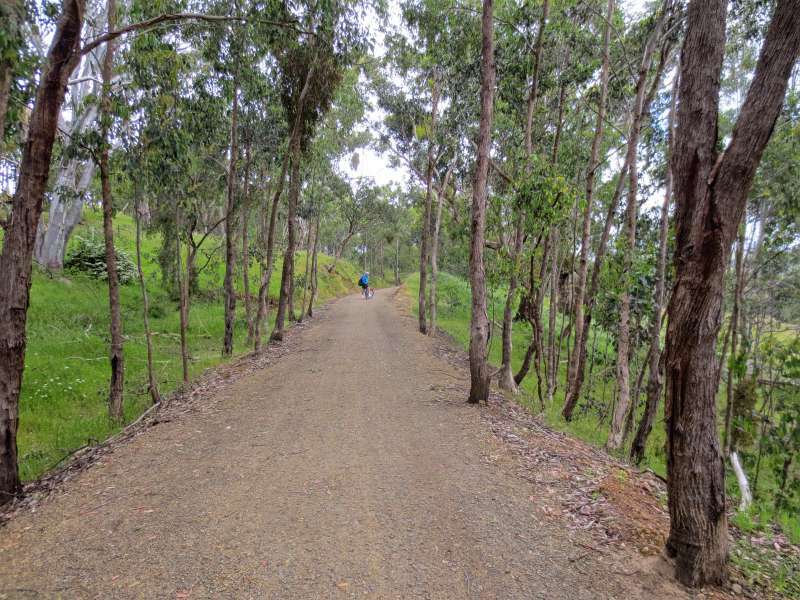 The Great Victorian Rail Trail looks both peaceful and beautiful. There is quite a network of rail trails around the world. David and I seek them out and cycle as many as we can. A lot of cycling, but looks like a ton of fun! Love the composition of your picture of the Cheviot Tunnel. I love taking photos of tunnels. They always seem so mysterious. Haha- the problem with going downhill is that you always pay for it eventually. i never would have thought about cycling in Australia, but i've been reading quite a bit about it and it seems like a great way to see parts of it (ideally the flat parts). Hope i get to try it one of these days. Haha - Australia is mostly flat, which makes it ideal for cycling. Being the world's oldest continent our mountains have all worn down over time. You can actually walk/stroll to the top of our highest mountain. I have done it more than once.